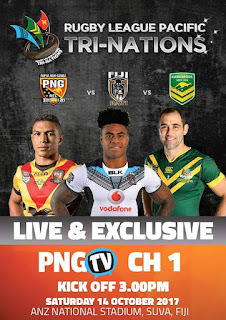 Today's Pacific Tri-Series between Australia, Fiji and Papua New Guinea is available to watch via Live Stream on our page below or on the Asia Pacific Rugby League Confederation site . The tournament, from ANZ Stadium in Suva, will see the Kangaroos, Bati and Kumuls play each other in three 40-minute games in preparation for the upcoming Rugby League World Cup. The event kicks off at 5:30pm Fiji time (4:30pm Sydney, 3:30pm Port Moresby) when the Kumuls take on the Fiji Bati. Second game will be at 6:30pm Fiji time (5:30pm Sydney, 4:30pm Port Moresby) when the Kangaroos take on the Kumuls, before the final game is at 7:30pm Fiji time (6:30pm Sydney, 5:30pm Port Moresby) when Fiji takes on Australia. The Live Stream of the game is available below or you can visit www.asiapacificrl.com/livestream or you can watch below.